Licking, twirling columns of green, yellow and crimson fire leap and dance through the hole in the top of the furnace. It is a pocket of pure heat. Without protection it will burn your eyes and melt the hairs in your nose. The furnace roars with the primal power of combustion that you don't hear with your ears as much as you feel deep in your chest. Within the golden glow of the crucible inside the furnace, the bronze ingots slowly yield their solidity and settle into a yellow-white pool of pure energy. It's part fury, part ecstasy and all awesome. In a few moments the molten bronze will be poured into molds and frozen into forms that are intended to be beautiful or evocative or provocative. Shapes that have rhythm and reason and invite viewers to engage in a wonderful pursuit: the appreciation of art. 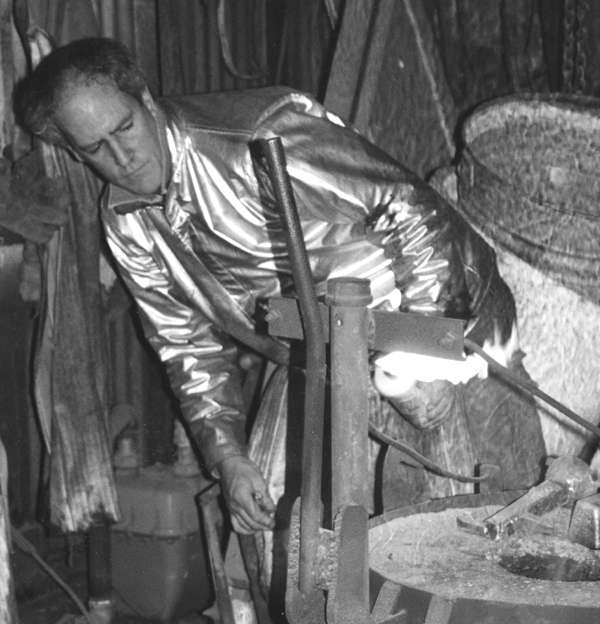 The physical manipulation of the elements is the flashiest aspect of bronze casting and it requires knowledge of a very specific technical discipline. But it is just a part of a much larger, less visible process. What starts as a private meditation or inspiration becomes a personal expression that gets fixed in three dimensional reality and ultimately is transformed into a public interaction between the art and viewers. I believe that art is an expression of being alive. So, regardless of whether I have chosen sculpture or the fates have conspired and directed me here, this is my life. Welcome to my domain.